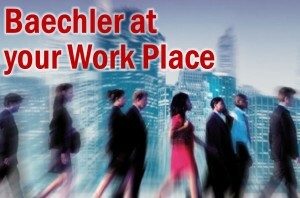 Welcome to the professional world of Baechler Teinturiers. Our company is the Swiss leader in the cleaning and care of textiles. With local shops in the main cities of the country, and an offer dedicated to companies and corporations, Baechler Teinturiers’ know-how is unrivalled. Using Alliant up-to-date technologies, with respect for the environment and more than 180 years experience, Baechler Teinturiers is above all a company dedicated to quality and customer satisfaction. The following services are available in our shops; cleaning, stain removal and ironing of all types of textiles (clothes, bedding and soft furnishings such as curtains) and all materials (silk, linen, cotton, polyester, viscose, wool, cashmere, feathers, leather and suede, fur etc. ), including those with inlaying and embellishment. We also carry out alterations and use special care treatments on textiles such as dressing, water- proofing, starching, dust-mite and moth- proofing. In our specialist workshops we are also known as Masters of Cleaning and Restoration of Rugs. Our home delivery service covers all of French-speaking Switzerland. Look for the closest shop to where you live. Your time is too precious! No need to desperately look for a parking space, to run in order to arrive on time, to wait at the counter! With Bachler Business Service, Dry Cleaning comes to you and offers you the same high-end service as in our shops. Talk to your Boss. Your company can now enjoy this privilege. Do not wait, our Customer Care Department is at your service.